Watch Face to Face with the Prime Minister, a special CBC News presentation in which 10 Canadians with diverse backgrounds and viewpoints from across the country question Prime Minister Justin Trudeau face to face, alone in in his office, behind closed doors. If you could ask the prime minister any question, what would it be? CBC brought 10 Canadians with diverse backgrounds and viewpoints from across the country to Ottawa to question Justin Trudeau face to face. Neither politicians nor special interest advocates, these Canadians were given unprecedented access, each sitting down with Trudeau alone in his office for 10 minutes, behind closed doors, to ask him about the issues that matter to them. The interviewers grilled Trudeau on a wide range of issues. Throughout it all, only CBC cameras were allowed in the room — no staffers, no advisers and no reporters. See full 10-minute interviews below, and watch above as The National's Peter Mansbridge sits down with Trudeau for in-depth follow-up questions. 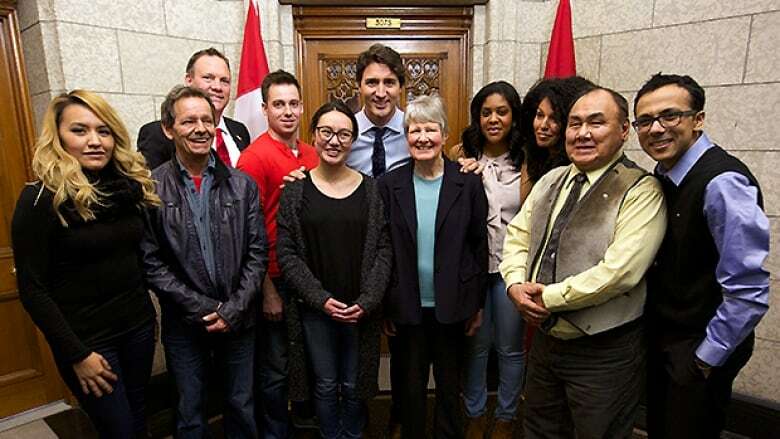 Nikki Fraser, a 25-year-old youth worker from Kamloops, B.C., asks Trudeau how he plans to keep indigenous women safe. With tears in her eyes, Fraser showed the prime minister photographs of her aunt and cousin, both Indigenous women who have gone missing. She demanded to know what Trudeau will do to keep Canada safe for her three-year-old daughter. "I don't want her to grow up in a country where I feel like her life is less valuable than a non-indigenous girl's life," she said. "This matters," Trudeau replied. "Indigenous lives matter." Danny Strilchuk, a 30-year-old oilfield worker from Edmonton, asks Trudeau if there is anything to give him hope for the future in Alberta and how he will generate jobs. "When Alberta does poorly, the rest of the country is going to feel the impact," Strilchuk told CBC News ahead of his interview with Trudeau. Trudeau told Strilchuk: "Hopefully oil is going to start bouncing back .... at the same time, we're going to start diversifying the economy." Neil Piercey, 58, formerly worked in manufacturing but now delivers fruit in London, Ont. He asks Trudeau how he plans to help people who have lost their jobs in manufacturing and are struggling to survive. Piercey made a very personal plea to the prime minister, and left disappointed. "I have a mortgage and I have family, so I had to cash in my RRSP," he told Trudeau. "Now I'm stuck. I have no pension. I had to use it up. I don't know what I'm going to do." Trudeau said the government is working to address pension security for Canadians and create employment opportunities. "But in the meantime I'll be starving and maybe living on the streets by the time I'm 65?" Piercey asked. Larry Audlaluk, 65, is a hunter and leader from Grise Fiord, Nunavut. He asks the prime minister about the government's plan to deal with the direct impact climate change has on Canadians in the North. This self-described patriot asked the prime minister whether the government would defend Canada's Northwest Passage from foreign powers looking to make use of its resources. "The Northwest Passage is Canadian," Trudeau said. "People can't just abuse it." Gary Mauris, 47, of Vancouver is president of Dominion Lending Centres. He asks Trudeau about the impact tax hikes to the wealthiest Canadians will have on the economy. Mauris believes hikes to the highest tax bracket negatively affect businesses like his, which employ many Canadians. Trudeau defended the hikes as a necessary so the government could give middle-class Canadians a tax break. Mauris told the prime minister: "You're not Robin Hood." Jihane El Atifi, 29, is a Montrealer who works with refugees. She asks Trudeau how he's working to integrate Canadian newcomers, and why there is no black representation in Cabinet. "I was pleasantly surprised to see your cabinet [had] gender parity," Atifi told Trudeau. "But I couldn't help but notice, and I think I'm not the only one, that there's no representatives from the black community." The prime minister replied that there's always more to do. Jenna Fray, 31, a social worker from Ajax, Ont., asks Trudeau what he's doing to help middle-class families like hers. "My biggest fear is that I don't give my son a better life," Fray told CBC News before meeting the prime minister. She told Trudeau: "Think of us. Do the work every single day on the ground." He replied: "The day I forget about you and your family is the day I'm no longer worthy of sitting in that chair." Yvonne Jacobs, 71, is a retired nurse in St. John's, N.L. She asks Justin what can he do to improve health care for seniors and for everyone else in Canada. Jacobs reminded the prime minister about Canada's aging population and insisted home care needs to be more than "just light housework," but also include comprehensive medical care. Trudeau agreed. Charlotte Kiddell, 24, is an undergraduate student from Halifax. She asks Trudeau about his plan for graduating students in bleak economic times and how he plans to tackle student debt. When Kiddell asked whether Trudeau would end what she calls "exploitative" unpaid internships, Trudeau said it's something the government is looking at. Maulik Doshi, 30, works in e-commerce in Regina. He asks Trudeau what he's doing to enforce national security and keep up the fight against ISIS and prevent radicalization of Canadians. Doshi was unimpressed with Trudeau's plans to pull Canada's fighter jets out Iraq and Syria, saying more needs to be done to end terrorism abroad and at home. Trudeau insisted: "We are going to remain an important part of the coalition against ISIL."